Photo by Jan Jacobsen 2008. I’ve been working on the second book of a planned three-part trilogy for a while—it seems like years, but it’s been just a few months. Time has been dragging because the book has been progressing poorly. Sometimes I think all my books progress poorly, but this one really has hit Olympian heights of lousy progression. Everything is bad. My outline refuses to come together, and no matter how I approach it, I can’t seem to fill the holes. My writing is flat. To look at my story notes, you’d think I have enough good, strong conflict, but it isn’t working. I have a cute opening scene that I like a lot, but it doesn’t reflect the rest of the book or sufficiently introduce the story questions. If I cut that, I’ll be cutting the best thing in the book. I want to just keep writing—get that first draft done!—and so far, that’s been my path. I’ve got almost 45,000 words now, and I hate it. Nobody wants to read this mess, including me. Skule Brass Quintet Christmas concert led by Malcolm McGrath, 2007. 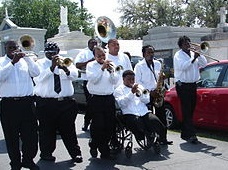 Hot 8 Brass Band plays jazz funeral for New Orleans blogger Ashley Morris. Photo by Howie Luvzus, 2008. So what am I going to do? I don’t mind working hard, and writing is full of frustrations. I get that. But when a story isn’t panning out, it might be time to give it a rest. Will it be a funeral or just a temporary halt? So what about you guys? Have you ever hit a wall? What did you do then? And why? This entry was posted in Creativity, Journey, Priorities and tagged bad writing days, creativity, first draft, Kay Keppler, romance writing, writing process. Bookmark the permalink. I’m still using the excuse that anything I write is still in the practice stage. I’m not at the Million Words stage, I don’t think. So, for me, it’s about producing a million of decent, fun words, no matter how I have to do it. Good point, Michaeline—it isn’t like leaving children on the street. I have been feeling a bit that way, that I got a troublesome child, she’s all noisy and talks back and is disobedient, and now I want to ditch her for the sweet, pretty one that does what I tell her. Until my hard drive crashes and burns or I figure something else out, I can always go back. It might help to have some sort of ceremony — a little story orphanage with very sweet matrons who will give her hot milk and a yoga mat. (-: Oh, I am so screwed up. But, you can put a story to bed, and revisit it later. I hit multiple walls with Cam and Mary’s book (second in my contemporary series), and I’m still really frustrated about it because I know who they are, how their characters evolve and why they deserve each other. So far I haven’t been able to find the plot that excites me and expresses what I know about them. After my first couple of efforts didn’t really gel, I tried going back to write a novella about the beginning of their shared backstory. That shaped up okay and threw me back into another attempt at the main book, and I created an outline that made sense but when I came to write it, I didn’t want those characters to do those things. I got sidetracked by secondary characters. It didn’t feel right, but I couldn’t get past it. Then I got an idea for a fantasy story so I decided to give it a try, just to refresh myself by writing something totally different. I’m wrestling with that story at the moment but in a positive way. The people and many of the world and plot elements are in place, even if they are playing up right now. I believe I’ll finish this book and will go on to write more stories in this world with these characters – there is much more to explore than I can manage in one book. I’m also planning to go back to Cam and Mary. I know Michaeline said it’s not like we’re leaving children on the street, but these characters are still alive in my head so I have a touch of that feeling. I love them and it bothers me that I am leaving them in limbo. I’m going to tell their story, and then Rob’s (which I have lots of notes about already), and then Sasha’s – I have some ideas about her, too, and I’m going to do some bonus story research this summer en route to RWA in San Diego. That’s about a decade’s worth of writing at my current pace. I need to write faster. I’m thinking maybe alternating between the two series might keep my story brain happy. Argh! This sounds like my situation. I know these people, I like them, I know what they want, I just can’t make it work. It sounds like you have a long-term plan, though, which is good. I think that’s really the only way to look at a writing life. II reach that point with, not every book, but as often as not. When I hit that with Dara and Belial, I set them aside and wrote the first chapters of a novel about Adie Phelps, a woman who wins an extreme makeover and then returns home to the husband who married a homely woman for a reason and the 12-year-old daughter with the nose Mom just got rid of. As soon as my heart and brain were, I thought, fully engaged in Adie’s story, Dara and Belial hollered, “We’re ready!” so I set Adie aside. They weren’t lying–the rest of their story wrote itself. My WIPs are like dysfunctional relationships, where they only behave nicely when I’m standing at the door, threatening to leave them for someone else. Ha! What a great story, Jeanne! Congratulations on all your characters returning to the fold. I’m glad to hear they came back and you were able to finish them. I think I might try that strategy. I keep plodding along a la Nora Roberts. I’m too stubborn to let it go. Although I’m at the same place with my story as you are. Maybe I need to go back to my other unfinished manuscript and see if I can beat that one into submission. This is the first manuscript I’ve felt unable to complete, and I too am normally very Nora-like in the sense of sitting down and hammering it out. I just wish I could be as prolific as she! Just today I was thinking, If I redefine my heroine’s goals, just a little, does that give some of these scenes more punch? It might. I’ve already trashed two versions of the looking-for-houses scene. Can I stand to try again? I don’t know. 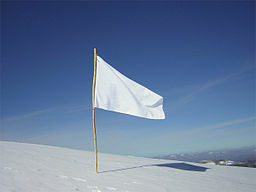 I might have to lie down with a cool cloth on my forehead for a while and think about it.